Such focus as he learns to write the words. "Brave spelling" they call it. I love that the word brave is involved. It makes me feel like he's a little superhero, boldly embarking upon the glory of words. Translation for those of you who can't quite make it out: "When I grow up I am going to be a rabbi. I will tutor with kids. I will work at Am Shalom." It's a pretty neat feeling when your kids want to follow your footsteps. He's only 6, so who knows! The People of the Book - A Must-Read! Looking for my giveaway? Click here. This week I read devoured a most wonderful book. The book tells a fictionalized story of the Sarajevo Haggadah, a book that was saved many times throughout its history -- through the Inquisition to the Nazis. The book jumped through many lands and time periods. In each, I held my breath, knowing that the Haggadah would somehow show up, would somehow tie itself into the story. The technical aspects of the book's restoration combined with the storytelling is just breathtaking. And the twist...! Divine. And let me tell you -- I had only 2 chapters left when we turned out the lights. I laid in bed mulling over the book, I couldn't sleep! So I went downstairs, finished the book (20 minutes or so) and finally could rest. That's how good this book was. He said: "Mom, aren't you going to be cold in that!?" Me: "I think I'll be fine, honey." Him: "Mom, I think you should put on pants." It's wild to hear your words thrown right backatcha, isn't it?! Don't forget my giveaway...right here! As many of you know, my third child (after 2 boys) is a girl. 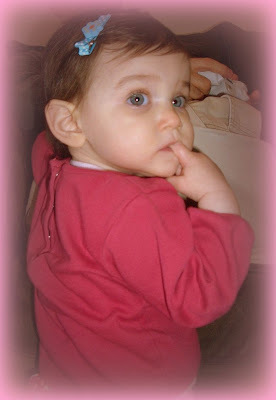 As soon as she was born, pink stuff started to descend upon my house in glittery waves. Pink shirts, pink pants, pink shoes, pink socks -- pink, pink, pink. And along with it, things that said "Princess" all over them. So I've thought about it. Because she sure is cute and let me tell you, some of those pink outfits are truly adorable. Here's my decision: I think that my daughter can wear adorable clothes and hair clips as long as I also give her strong lessons in girl power. Which is why I'm so excited for this giveaway, which I feel blends adorable girl-stuff with a strong female role model! 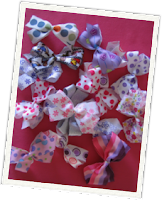 Any 2 items of your choice from Oopsie Dazie...check out their adorable hairclips, headbands, bows, and headwraps. Aren't they cute? and affordable, too. Rules and other Information -- How can you win? 1. Make a comment here. How do you instill confidence and strength in girls? This is your entry! U.S. shipping only, sorry Robin & other international folks. 2. For an extra entry, post on your blog or tell a friend about this giveaway and Oopsie Dazie and link back to me. 4. This giveaway ends on Thursday, January 31st at 9pm Central Time. Winner will be announced Friday morning! **UPDATE: Deadline extended to Friday, February 1 @ 8:00am** Winner announced shortly afterwards. I leave for Israel in 17 days! We're celebrating my daughter's 1st birthday next week. Wow. What are you excited about??? from my del.icio.us ...add me to your network? Some of you read my post on this woman who was denied service at Steak N Shake because she is deaf. Fox News Chicago picked up the story and so did a lot of other bloggers. Last night, shortly after calling the corporate headquarters via relay, an employee from their Human Resources division called me. She sent me an email apologizing for the incident. She called again this morning to see if we could set up a meeting with the manager in question and discuss the issue. They agreed to provide an interpreter for this meeting. What do you think? Will you go to Steak and Shake? I think I won't. heard what God had done. that the Israelites were free! So he came to Mo. Mo told the whole tale. Now Mo was the judge. to all their problems and fights. "This is not so good,"
Jethro had a better way. They judged what they could deal with. Hard stuff went to Mo. to wait for God's words. Loud blast of the horn! So Mo spoke for God. will be fine for sacrifice. Ah...do we follow all the laws? Stay tuned for the next few weeks...Exodus rocks. More Haiku Friday...over here this week while Jennifer gets settled in Indiana. Things like this just should not happen in 2008. We are supposed to be better than this. ...who will be hosting the Celebrate Women Purim Party with me in March...so come back for all the fun. Thank you so much to all who joined in the Tu B'Shevat Birthday Party! In honor of Tu B'Shevat, we had green pancakes for breakfast. Aren't they pretty cooking? The funniest part: David refused to even let me do it. I had to dye only the end of the batch and I *had* to eat them myself! They were yummy. Maybe I'll try green eggs next. How are you celebrating Tu B'Shevat today? In honor of Tu B'Shevat (the Birthday of the Trees) and the commitment to the earth that the holiday brings with it (read more here and here), I am so excited that b.happybags is giving away one of their gorgeous reusable shopping bags to one of my lucky readers!!! (Isn't it pretty???) All domestic materials and made right here in the U.S.A. Gotta love it. 1. Make a comment here or yesterday's Tu B'Shevat posts. How are you "going green"? What is your green legacy...? This is your entry! You can enter each day - once per day. 2. For an extra entry, post on your blog or tell a friend about this giveaway and b.happybags and link back to me. 4. This giveaway ends on Tuesday, January 22nd at 9pm Central Time. Winner will be announced Wednesday morning! Go Vegetarian and be green? As the holiday of Tu B'Shevat comes tomorrow, I know that I am wishing I was outside in warm weather celebrating trees by looking up at them instead of keeping my head down out of the cold wind! May we all find the way to do enough so that we can say to our children, I helped to make sure there were trees for you to sit under, my dears. 1. Make a comment here or tomorrow's Tu B'Shevat posts. How are you "going green"? What is your green legacy...? This is your entry! You can enter each day - once per day. Come back and visit all week for this and other giveaways. Winner of PopJudaica Tu B'Shevat Garden Giveaway! In honor of Tu B'Shevat (the Birthday of the Trees) and the commitment to the earth that the holiday brings with it (read more here and here), PopJudaica has offered to give a Tu B'Shevat Garden. PopJudaica is a fun and slightly irreverent shop devoted to creative and downright cool Judaica. In fact, they're having a Tu B'Shevat party of their own so just mosey over there to see the whole Green Collection, with proceeds from these products going to Hazon, an organization whose mission it is to create a healthier and more sustainable Jewish community. Come back tomorrow for one last Tu B'Shevat giveaway from b.happy bags! As we travel on our path through life, we all know that we have a job to do, a responsibility for something. What is it? What is our calling? What is the task that consumes our days on earth? Rabbi Tarfon taught: It is not our job to complete the task, but neither are we free to abstain from it. Our world is in pain. War, famine, plague, suffering, destruction.... where to start? Does my little corner make a difference? Does it matter if I change a bulb, carry a bag, bring my lunch, skip a water bottle....reuse, reduce, recycle? Dare I think that I and my fellow travellers on Spaceship Earth really can make a difference? Ah...but I do believe we can. I do believe that one who saves a life saves a world. I do believe that each act we take can make a difference, and I do believe that we matter to each other as well. It's not just me changing a bulb, carrying a bag, bringing a lunch but it's all of us, together. See more Sunday Scribblings here. In honor of Tu B'Shevat (the Birthday of the Trees) and the commitment to the earth that the holiday brings with it (read more here and here), I am so excited that PopJudaica has offered to give a Tu B'Shevat Garden to one of my lucky readers!!! PopJudaica is a fun and slightly irreverent shop devoted to creative and downright cool Judaica. In fact, they're having a Tu B'Shevat party of their own so just mosey over there to see the whole Green Collection, with proceeds from these products going to Hazon, an organization whose mission it is to create a healthier and more sustainable Jewish community. 1. Make a comment here or Friday's Tu B'Shevat posts. What kinds of things do you plant? How are you "going green"? This is your entry! You can enter each day - once per day. Come back and visit all week for this and other giveaways. 2. For an extra entry, post on your blog or tell a friend about this giveaway and PopJudaica and link back to me. 4. This giveaway ends on Sunday, January 20th at 9pm Central Time. Winner will be announced Monday morning, along with the next Tu B'Shevat Birthday Giveaway! Come back all week for the Tu B'Shevat Birthday Party and more green green green....re-use a bag, hug a tree, plant a flower! to count up the tithe. Join in! Hug a Tree! *Tu in Hebrew is 15, therefore the name of the holiday, like the Fourth of July, is the name of the date. It is the 15th of the Hebrew month of Shevat. 1. Make a comment here or on tomorrow night or Sunday's Tu B'Shevat posts. What kinds of things do you plant? How are you "going green"? This is your entry! You can enter each day - once per day. Come back and visit all week for this and other giveaways. Make sure you check out her blog, it's great. 1. Trees are a source of shade when the sun is hot. They protect our homes, our grass, our land, from the heat of the sun. Trees control climate by moderating the effects of the sun, rain and wind. Leaves absorb and filter the sun's radiant energy, keeping things cool in summer. 2. Trees produce nourishing fruits and nuts for humans to eat. 3. Trees purify the air we breathe and are sometimes called the "green lungs" of our cities. 4. Trees help prevent the soil from erosion and the land from becoming a desert. 6. Many animals, including elephants, koalas and giraffes eat leaves for nourishment. Flowers are eaten by monkeys, and nectar is a favorite of birds, bats and many insects. Animals also eat much of the same fruit that we enjoy. 7. Hundreds of living creatures call trees their home. Leaf-covered branches keep many animals, such as birds and squirrels, out of the reach of predators. 8. They have a wide variety of practical and commercial uses. Wood was the very first fuel, and is still used for cooking and heating by about half of the world's population. Trees provide timber for building construction, furniture manufacture, tools, sporting equipment, and thousands of household items. Wood pulp is used to make paper. 9. The bark of some trees can be made into cork and is a source of chemicals and medicines. Quinine and aspirin are both made from bark extracts. The inner bark of some trees contains latex, the main ingredient of rubber. 10. Today, there are over 200 million trees in Israel – forests of pine, tamarisk, carob and eucalyptus. 11. Since its founding, the Jewish National Fund has planted more than 240 million trees in Israel to protect the land, prevent soil erosion, green the landscape and preserve vital ecosystems. 12. Israel is the only country in the world that entered the 21st century with a net gain in numbers of trees. 13. The Yatir Forest, which grows on the edge of the desert, is the largest of Israel’s man-planted forests. The father of afforestation in Israel, Yosef Weitz, jabbed the ground of Yatir with his walking stick and declared: "A forest will grow here!" contradicting the experts who argued that it was impossible for trees to grow on such arid soil. Which generally sums up Jewish gumption! Some of these are from SavATree and some are from Jewish National Fund. 1. Make a comment here or on yesterday's Tu B'Shevat posts . Do you use reusable bags for groceries, lunch, shlepping? This is your entry! You can enter each day - once per day. Come back and visit all week for this and other giveaways. 4. This giveaway ends on Thursday, January 18th at 9pm Central Time. Winner will be announced Friday morning, along with the next Tu B'Shevat Birthday Giveaway! Come back all week for the Tu B'Shevat Birthday Party and more green green green....re-use a bag, hug a tree! Waste Not... and a Giveaway! Did you know how easy it is to save the world? One Sandwich at a Time! Pack a peanut butter and jelly sandwich instead of buying a lunch based on animal products, like a hamburger, fried chicken, or ham sandwich. Want to do more? Have another PB&J tomorrow. from the PB&J Campaign -- check it out! But has this ever happened to you? Put it together...and you'd never know the difference! And you haven't wasted the end. That's what Works for Me! What works for you? 1. Make a comment here or on any of my Tu B'Shevat posts today or tomorrow. Do you use reusable bags for groceries, lunch, shlepping? This is your entry! You can enter each day - once per day. Come back and visit all week for this and other giveaways. Melody A. - the HipMomma! Eco-Libris is trying to balance out our books -- planting a tree for every book. They're going to plant 10 trees for Melody A., with accompanying stickers to put into her own books to proudly show her "tree offset" and her commitment to the environment. Please check them out and get your own tree offsets! -- they offer gift cards and easy payment via Paypal. Their blog is full of great greeny stuff. Thank you, Eco-Libris! Read this (Wednesday's) post for the next giveaway, from Skeeda bags! I have posted before about being a vegetarian. I do not usually proselytize about the veggie life -- in fact, I know that many people will never give up meat (hi Dad! hi Harry!). But that doesn't mean that eating a plant-based diet, even a few times a week, isn't a good idea for all of us. One of my favorite "earth-saving" tips is to eat a meat-free meal at least once a week. Animals raised for food are responsible for 18% of global warming emissions -- more than transportation. Most of the 78 million acres of razed rainforest worldwide is to be used as grazing land to produce meat for North America. This leads to global warming, desertification, and driving 80% of the earth’s species to extinction. Every hamburger is the equivalent of 55 square feet of razed rainforest. Producing plant foods is 5-50 times more energy efficient than producing animal products! A pound of steak is the equivalent of burning a gallon of gasoline. In honor of Tu B'Shevat, which is next Tuesday...can you do it? Can you go meatless once, twice, three times a week? One week each month, can you go meatless? What's the challenge you're willing to take to save even one tree, one acre of forest, one little bit of fresh air? Seitan, a high-protein food made of wheat gluten, gives this stew a “meaty” texture. Prepared seitan is readily available in most natural foods stores as well as a growing number of well-stocked supermarkets. Heat half of the oil in a large soup pot. Add the onion and garlic and saute over medium heat until the onion is golden. Add 3 cups of water along with the potatoes, carrots, bouillon cube, and seasoning. Bring to a simmer, then cover and simmer gently for 25 to 30 minutes, or until the potato and carrots are tender. Meanwhile, heat the remaining oil in a large skillet. Add the seitan pieces and saute over medium-high heat, stirring frequently, until most sides are nicely browned and crisp. Once the vegetables are done, use the back of a wooden spoon to mash enough of the potatoes to thicken the base of the stew. Stir in the sauteed seitan and peas. Add a bit more water if necessary. The consistency should be thick and moist, but not soupy. Cook over low heat for 1 to 2 minutes longer. Season with salt and pepper (use salt sparingly, if at all, since the bouillon cube and seitan add a salty flavor), then serve in shallow bowls. Don't forget the Tu B'Shevat Giveaway! Eco-Libris is trying to balance out our books -- planting a tree for every book. They've generously offered to plant 10 trees for one lucky reader, with accompanying stickers to put into your own books to proudly show your "tree offset" and your commitment to the environment. Check them out -- they offer gift cards and easy payment via Paypal. Their blog is full of great greeny stuff. 1. Make a comment here or on any of my Tu B'Shevat posts. Say something nice about trees or the earth. Make a meatless pledge? This is your entry! You can enter each day - once per day. Come back and visit all week for this and other giveaways. 4. This giveaway ends on Tuesday, January 15th (that's today) at 9pm Central Time. Winner will be announced Wednesday morning, along with the next Tu B'Shevat Birthday Giveaway! Come back all week for the Tu B'Shevat Birthday Party and more green green green....hug a tree! For the Love of the Trees - Tu B'Shevat is Coming! It's here! 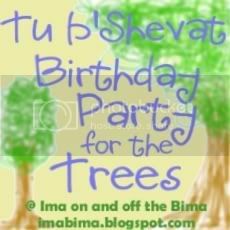 My big Tu B'Shevat Birthday Party for the Trees is here! Tu B'shevat is the Jewish holiday celebrating the "new year (or birthday) of the trees." The name comes from the calendar date on which it falls: Tu is the Hebrew equivalent of 15 and Shevat is the Hebrew month in which we are in right now. Tu B'shevat was originally a day when the fruits that grew from that day on were counted for the following year in regard to tithes. In modern times, it is celebrated as a Jewish "Earth Day" -- celebrating trees, planting trees, and reflecting on environmental and ecological issues. This year, Tu B'Shevat falls on Tuesday, January 22nd, next week. Over the next week leading up to Tu B'Shevat, I'm celebrating green here at Ima on and off the Bima with a Birthday Party for the Trees! No party is complete without party favors, so visit all week for giveaways and winners -- giveaways will be posted today, Wednesday, Friday and Sunday so come back each day this week! My children love books. We have a large collection, they love to read (and chew) on them. My whole family loves books. But did you ever think of the environmental impact of your books? Books are, of course, made from paper, which comes from trees. 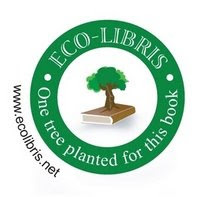 A new organization, Eco-Libris, is trying to balance out our books -- planting a tree for every book. They've generously offered to plant 10 trees for one lucky reader, with accompanying stickers to put into your own books to proudly show your "tree offset" and your commitment to the environment. Check them out -- they offer gift cards and easy payment via Paypal. Their blog is full of great greeny stuff. 1. Make a comment here or on any of my Tu B'Shevat posts. Say something nice about trees or the earth. This is your entry! You can enter each day - once per day. Come back and visit all week for this and other giveaways. 4. This giveaway ends on Tuesday, January 15th at 9pm Central Time. Winner will be announced Wednesday morning, along with the next Tu B'Shevat Birthday Giveaway! the Birthday of the Trees! Moses brought God's threat to Court. "Who should go?" they asked. one more time: "no how!" Mo left in a huff. the first-born of Egypt died. "Get out and go and leave us!" and so they packed up. was the number of years there. I am not usually one to make New Year's resolutions. In fact, I generally consider January 1st to be an interesting change but never feels "different" in the way that Rosh HaShanah does for me. But this year, in the last week of December, I came across the 101 in 1001 challenge. The idea of creating 101 things to do in such a lengthy period of time (1001 days) is more interesting to me than making loose resolutions that I may or may not keep in a year. I had a number of ideas for my list but many of them involved my husband and family. So I convinced begged invited my husband to join me in the challenge. Together we made a list of 50 things to do in 1001 days, and then we each made a list of 51 more personal things. Some of them are simple: Take our vitamins every day (#7), kiss a child every day (#2), some are fun: watch one movie together each week (#23), change the CDs in the car once a month (#34), some are big projects: organize our closet (#44), organize the basement once a month until it's done (#29)....some are private! 2. Keep track of all the books I read. 3. Make sure I'm in more of the pictures. 4. Attempt one month each year of the 365 Photos Challenge. 5. Execute one crafty project every three months. 6. Buy bottled water no more than 1x a month (use water bottle). 7. Use travel mug at least twice for every 6 visits to coffee place. 8. One month each year, no Starbucks at all. 9. Start a vegetable garden. 10. Attempt to have a neighborhood block party. 12. Make soup once a month. 13. Use slow cooker 3x each winter. What are some of your goals? I think this challenge is so powerful because of the length of it. I am keeping the list posted in my kitchen, inside a cupboard, divided by daily, weekly, monthly, yearly tasks. How do you keep the toys organized? How do you keep all the pieces together so that the toys can be played with in their set? Help me, O Wise Internet! Obviously, our children want to be like us. They want to do what we do and have what we have. I know that my children (all of them!) think my Blackberry is the coolest toy in the house. There is great power here. Even without realizing it, I have taught them something about what I value. Do I teach them that the Blackberry takes Mommy away from them, or do I teach them that it helps us connect to the people that we love? I hope for the latter, and I think I'm doing alright when my 2-year-old just want to call his grandparents whenever he takes my phone. But it is an awesome responsibility knowing that these little people emulate my every move. My husband loves to play video games. Therefore, my children want to play with the controllers. These controllers, they know, are important in some way. They don't know exactly what they do, but they want them! Here is Yael, enjoying the controller that her dad has let her play with, while in th background, he plays his game. Just for good measure...I did a little editing of another one of these shots. What do you think? For more Best Shot Monday, go here. Stay tuned...beginning next Monday is the All-Green, All-Trees, All-Week Celebration of Tu B'Shevat, the Birthday of the Trees!